Quick Note: We have two bungalows. Should one be booked, inquire on our second listing, most of the time one or the other is available. Search Hale Awa Hawaiian Bungalows for more details. Note: The recent lava flow has slowed quite a bit. The state is currently building a viewing area, which places us centrally located near both Volcanoes National Park and the new viewing area. ** We are located in a banana belt just nine blocks from the ocean. This means we receive less rain than the surrounding area and are protected by the tradewinds, coming off the ocean, from volcanic gases and debris leaving us with fresh, high quality air. Additionally, we are not impacted by the current lava flow and are not in danger of being evacuated. The tradewinds are blowing the volcanic gases away from us, toward Kona and Oahu, leaving us with some of the freshest air in all of the Hawaiian Islands. Hale Awa Hawaiian Bungalows offer a high quality rustic atmosphere nestled in an Hawaiian coastal rainforest. 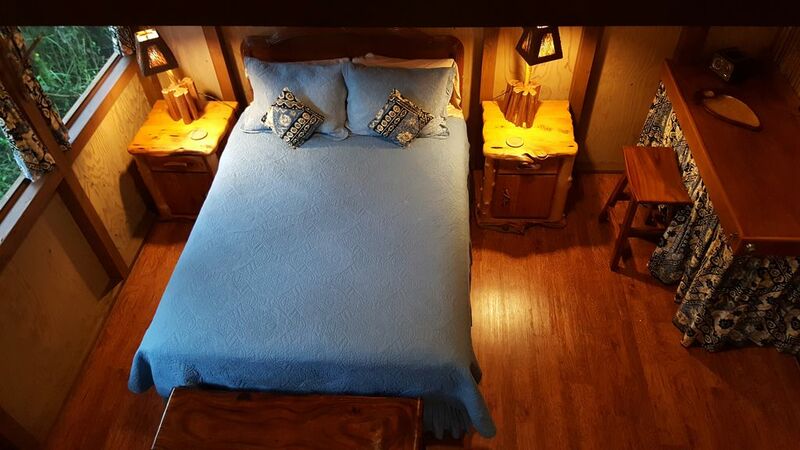 Located on a four acre estate our cabins are like none other. The quality craftsmanship is apparent in all the details and your comfort is our primary concern. Highest quality Beauty Rest mattresses assure you get a good nights rest. You'll be surrounded by nature whether you're dining at our covered exterior BBQ kitchen or lounging by our garden swimming pool. All just five miles from funky Pohoa Town, where dining and music are a way of life. For more info and pictures, just search "Hale Awa Hawaiian Bungalows"
HIGH SEASON: There is a four night minimum during the high season. The high season extends from December 1st through April 30th. Hale Awa (hall-lee ah-vah) Hawaiian Bungalows are located in Hawaii's lush district of Puna. Situated near some of the most beautiful landscapes Hawaii has to offer.... black sand beaches, Volcanoes National Park and the spectacular Red Road. Enjoy a slower way of life, swim with green sea turtles, witness the annual Humpback whale migration, climb a volcano or just relax by the sea. Hale Awa offers some the most beautiful affordable luxurious accommodations anywhere on the Big Island. Here sustainability does not mean giving up comfort. Completely solar powered and outfitted with heated rain water showers, our accommodations are both comfortable and carbon free. Spread over four lush acres of tropical landscape, including organic fruit orchards, exotic tropical flowers, native Ohia forests, swimming pool & extra large outdoor kitchen.... complete with southern style BBQ smoker. Note: Due to the surrounding forest we are unable to offer Wi-Fi, however, in near by Pahoa town there are several establishments that offer free Wi-Fi. Additionally, if you have T-Mobile cell service (they have free unlimited data plans) you should be able to access Wi-Fi, in fact, due to our location that is how we access the Internet on a daily basis. Our bungalows’ rustic charm and quality craftsmanship is apparent in the details. Great care has been given to every detail to ensure your stay is a comfortable one. Hale Awa Bungalows feature high quality queen sized beds with an extra queen bed in the sleeping loft (each bungalow sleeping a total of 4). Our bungalows, both Pohoiki (po-ho-e-key) & Ahalanui (a-ha-la-new-e), have a lanai sitting area, private garden rain-water lava shower, Hawaiian style toilet enclosure and local Hawaiian decor. Our bungalows are mirror images of one another and are approximately 400 sq ft each. Dine with a living room atmosphere in an outdoor tropical garden, our covered 20’x20’ exterior BBQ kitchen, "Ohia Lumi Kuke", is a shared area that features a southern style BBQ smoker, microwave, toaster, hot plate, sink, hammocks and hand made rustic Brazilian furniture ....Rain or shine, you can still enjoy the great outdoors. Relax with a cold beverage and grill that fresh fish you purchased from a local fisherman or forget the cooking altogether and enjoy a meal courtesy of one of our many fine family owned restaurants. Sustainable eco-friendly living provides peace of mind and a care-free holiday. Completely solar powered, we also collect rain water for our showers, making your stay comfortable and convenient without polluting our atmosphere. Located in the big island banana belt next to Nanawale Forest Reserve we receive more sunshine than the surrounding micro-climates. You are invited to come enjoy a rich eco-friendly tropical get-away on the green side of the island, we promise, it's a visit you won't soon forget! * Search for us on the web: Hale Awa Hawaiian Bungalows. *We came here for a holiday, and never left! A veteran of three Little league campaigns, reedman in a local jazz ensemble and highlighted by a brief stint in the Cub Scouts of America, Douglas' formative years where dominated by close family ties amidst the explosion of the baby boom generation. Traveling extensively throughout his life, Doug settled on Hawaii's windward coast as his permanent home. With it's spectacular geography, temperate climate, focus on sustainable family living and the island wide embrace of the astronomy community, it was the perfect fit. His artistic nature finds an outlet in every facet of Hale Awa Hawaiian Bungalows, from the quality of the bungalow builds to the myriad of endless details, there is always an enjoyable project that begs to be done in an never ending effort to improve Hale Awa and provide a unique and enjoyable environment with which to share with guests. toilet, shower, Bungalows feature an Hawaiian style toilet enclosure. Bungalows have an Hawaiian style toilet enclosure and exterior heated rain-water showers. Our bath area is considered a highlight by many of our guests! We offer a covered fire pit for your enjoyment. Covered area is equipped with a large cupola so enjoying a fire is possible (and recommended) should it rain! Bungalows have a small refrigerator/freezer. Our microwave has a door and a spinning turntable! Dishes and utensils are located in the Ohia BBQ kitchen. We feature an extremely large covered outdoor kitchen for all our guests. The kitchen comes complete with BBQ/Smoker, electric burner, microwave, utensils, sink & log furniture. Our covered exterior kitchen has everything you need to cook and areas to relax while you enjoy your meal. Our kitchen is equipped with built-in BBQ smoker/grill. We are surrounds by a natural coastal rainforest as well as manicured gardens and fruit orchards. Our pool offers a covered sitting area centered in a rainforest garden setting. Pool hours are dawn to dusk, pool closes at sundown. We have available a local guide that is very knowledgeable and quite the character for help with seeing all the best the area has to offer. Our local village, Pāhoa, has several family owned restaurants and they are all very good. Italian, Hawaiian, Mexican and Thai are just some of your choices....many feature live music as well. Douglas’ place is so nice. private, clean and very well organized. The outdoor shower is a standout! The remoteness makes the place magical. Skies covered with stars and frogs and birds singing you to sleep and out of it. Would recommend it to any nature lover. The cabin was lovingly crafted and very comfortable. We loved the outdoor shower! The kitchen/sitting area was complete with bbq, single burner, toaster and microwave. As a low carbon footprint option, I would highly recommend it! Connect with Nature—a Healing Vacation! We loved our stay!! The nighttime symphony of coqui frogs, crickets & rain lulled us to sleep each night. We felt very connected with nature between the screened only windows, outdoor rainforest shower, tart organic oranges, & beautiful stargazing!! Be prepared with bug spray, especially if you hike in the rainforest. Pahoa has wonderful restaurants! We enjoyed Peles Breakfast, Sirius Coffee, Ning’s Thai & Nicoco Vegan Gelato!!! Thank you Doug for the much-needed, healing vacation. The Big Island is a special place! We stayed with our two children (8 months and 3 y/o). The cabin is very well finished and the overall experience was worth it. The mezzanine bed was a little hot on humid nights but the main bed was comfortable with the sealing fan turned on. The outdoor kitchen is nice but it is a little bit under equipped for anything other then very basic cooking. The huge wood BBQ looks great in principle but in practice, using it requires some time and effort; which we did not have with two kids around! Plan simple meals or take outs if you want to eat there. The pool was great. Everything about this place was wonderful but the warm, outdoor shower was a really neat experience! Douglas was very responsive, the room was very clean, and our stay was quiet and relaxing. These cabins are really magical - they are set deep in a dense garden that feels completely secluded and private. Although it rained almost continuously while we were there (in March) they were cozy and comfortable, and the outdoor shower is really unforgettable. Will absolutely stay here for our next Hilo-side visit! Four night minimum for all holidays. Holiday rates are $114 per night, this includes, Memorial Day, Independence Day, Labor Day, Thanksgiving Holiday, Xmas Holiday, New Years and December through March.